Princecraft President Rodier Grondin accepts the Job Creator award. 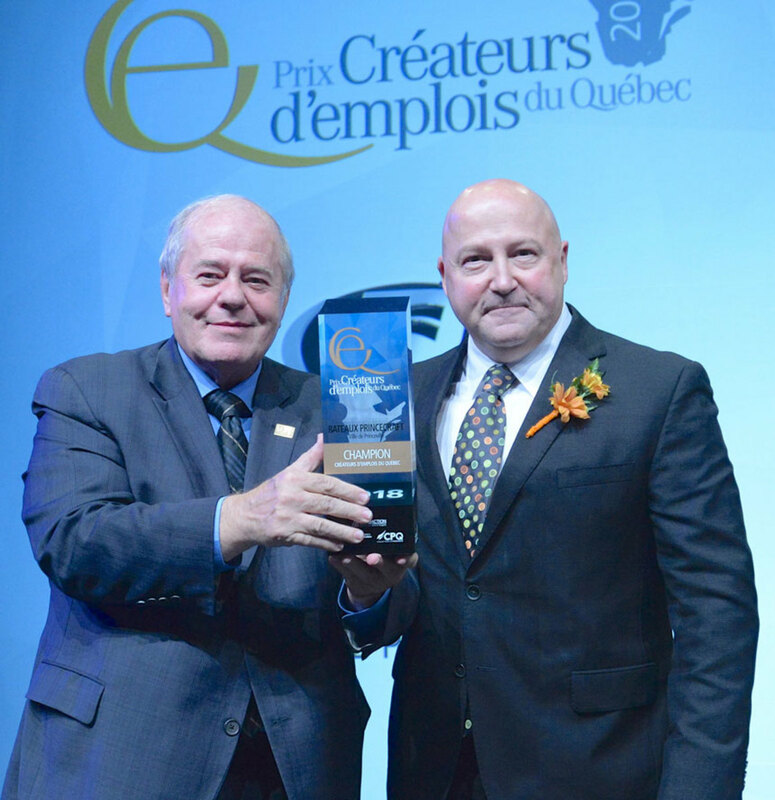 Princecraft has received a Quebec Job Creator Award in the category of Champion for Centre-du-Québec. The Brunswick builder received the award during a gala in late October. The awards were given based on the number of jobs created and maintained in 2017 as well as “sustainable development” of the employee base. Princecraft, which doubled its pontoon production in 2017, added 84 new workers, growing to 300 workers. It told the awards committee that it expects to add 100 more employees this year. “Because our company supports local purchases, our growth also has a positive employment impact for our suppliers and the entire region,” Princecraft told the awards committee. About 1,000 business people, entrepreneurs, managers, government representatives and business leaders from all regions of Quebec attended the event. Quebec Prime Minister François Legault was also on hand. Company is ranked number 219 out of 500. Derecktor shipyards, which signed a 30-year contract with the county commission in St. Lucie County, will build the country’s first repair and refit facility for sailing yachts over 150 feet. Sail & Ski Center is a strong presence in Austin and San Antonio. The Leukemia Cup Regatta is a series of events that raises money for blood cancer patients. The door to preventing E15 year-round is closing. Please make your voice heard. OEM Regional Sales Representative- C.P.S. Distributors, Inc.